You've played the Flash demo. You've seen the dice cup. But what about the dice? Well there they are. The final package will include 13 dice -- six green, four yellow, and three red. The colors indicate the "danger" of the die. Green dice are the safest to roll; you're likelier to eat a brain than roll a shotgun. 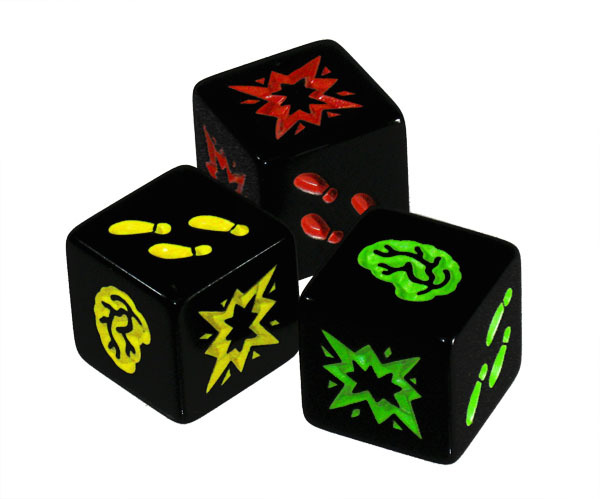 The yellow dice are middle-of-the-road, with equal chances to roll brains, feet, or shotgun. The red dice are dangerous! Half the faces are shotguns, so the odds are not in your favor when you roll one.